A Give Away Gift That Everyone Can Afford! Company umbrellas are a practical give away gift and here at Brollies & Parasols we work hard to keep our costs down so we can offer you extremely competitive prices. There aren’t many practical and useful products out there that you can fully personalise and brand at a low cost, but a company umbrella is a great way of doing this. Not only are umbrellas an easy product to brand and personalise, they are a great way to get your logo out there – just imagine seeing your logo walking down high streets across the UK for years to come! We like to think that a branded company umbrella is a walking advertisement. Your logo bobbing across parks, down streets and around events all over the UK plastered across a super durable fully personalised company umbrella. And this is not just a 30 second TV advert or a poster campaign that lasts for a week. A umbrella lasts for months and months – a Brollies & Parasols umbrella, with their super strong Fibre-Storm® fibreglass ribs, will last for years. 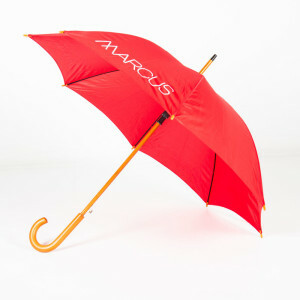 Whether you are looking to put an umbrella in a goody bag, a gift for all of your staff, a thank you present to your customers or a take-home give away at an event, a branded company umbrella is a simple way of making an impact with a gift that is practical, that will be used (if given away in the UK, used a lot!) and that is low cost. We offer one of the most comprehensive collections of umbrellas out there, including telescopic, golf and walker ranges. Whatever you want your company umbrella for – an event, give away or gifts – we have an umbrella to suit every requirement which can be fully personalised, customised and branded. Don’t worry about quality either – we understand that if you put your logo onto something you want that product to reflect the same high quality spec as your brand. We have a solid reputation for strong, durable umbrellas, and we are proud to work consistency with the same companies year after year after year. Once you have chosen to opt for an umbrella as your give away gift come to us and we can help you with the next steps. Not only can we offer a full design package for FREE, but we can find an umbrella for all types of budget. ← Get Your Brand Moving!